As Millennials enter the housing market, they are redefining home design trends. 20 and 30 somethings are heading towards the greener pastures of suburbia with very different expectations and desires than their parents. Millennial buyers want modern, sleek lines in their houses, yet they love laid-back rustic looks and “artisanal” home decor additions. They enjoy natural materials such as stone and wood but also crave the latest smart home technology, including colored lighting for their showers. Millennials are focused on making their space both functional, unique and aesthetically pleasing. Here’s a summary of popular home and interior design trends Millennials are seeking out. Millennials aren’t drawn to “cookie-cutter” home styles – they’re looking for something more personalized and unique. 55% – 66% of Millennials favor the suburbs over the city. 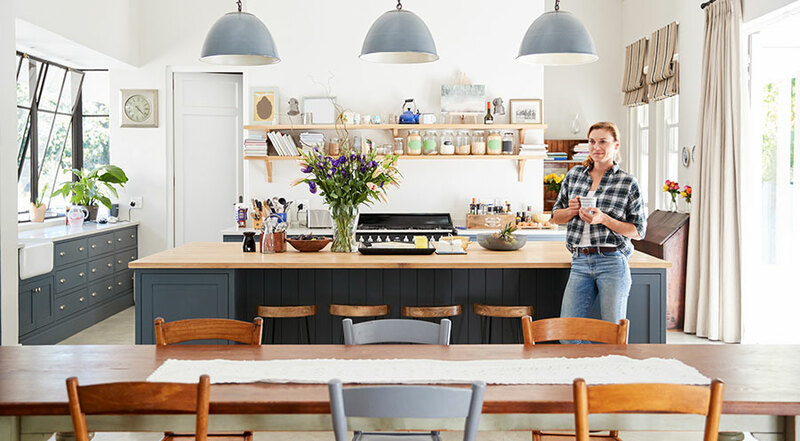 Almost half of Millennials prefer to buy “move in ready” homes versus “fixer uppers” as they just don’t have the time or money to devote to refurbishments. Minimalistic design, functional storage and energy-saving appliances are essential kitchen features. Although hosting large Sunday family dinners are not high on the Millennial “to do” list, they still enjoy cooking, especially experimenting with different techniques and cuisines. Their kitchens need to accommodate this. The majority of Millennials can’t imagine their lives without smart devices and other technological gadgets. A recent survey reveals that 72% of millennials would be willing to pay $1,500 more for a home that is “smart,” and 42% of those would be willing to pay as much as $3,000 more. Millennial homes may include a smart thermostat, 4KTV, smart hubs (controlling lighting, thermostats, music, TV with Amazon’s Echo, Google Home and Z-Wave, etc) and other devices that can make a homeowner’s life easier. They want to unlock their doors, control their thermostats and receive information about when their front door opens — all via their smartphones or devices. Looking to kick off your home renovation project? Builders’ General can help make your dream home a reality. Contact us to schedule your free consultation today.